Big Bald Lake is a jewel among the Kawartha Lakes of east-central Ontario. Nestled snugly to the west of Buckhorn, the lake is made up of a number of bays around the perimeter and random islands dotting the central portion, yielding a uniquely beautiful view from the shoreline of each property. Currently there are over 200 registered property owners on Big Bald Lake who have come to know this little paradise in the Kawarthas. Big Bald Lake is noted for its diverse and beautiful natural shorelines, fish and wildlife and the tranquil serenity. Big Bald Lake is located on the Trent-Severn Waterway and shares the same water levels as Little Bald, Pigeon, Chemong and Upper Buckhorn lakes. 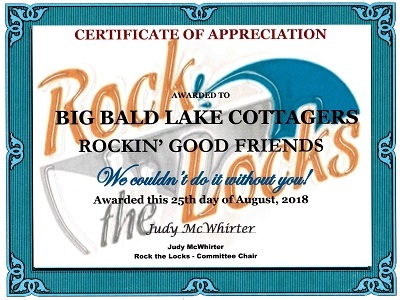 Big Bald Lake Cottagers' Association was formed in 1992 as a group of concerned lake residents who desired a forum that would bring people together both socially and to express common environmental concerns. We are a non-profit, volunteer-run organization. We became incorporated on January 12, 2001 as we continued to grow and keep abreast of lakeside development issues. Look for our Cenotaph Sponsor Stone at the Buckhorn Community Centre. 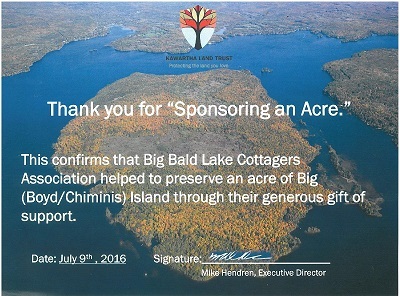 We sponsored an acre to help save Boyd Island. The BBLCA is a Rockin Good Friend! We sponsored Rock the Locks. We always welcome new committee members or volunteers for specific events.